Since I’ve been spending a lot of time playing console games, I’ve had an ongoing issue with a lack of good seating in the room my consoles live in (the guest room). There’s the guest bed, but it’s uncomfortable to sit in for long periods. I’ve looked at gaming chairs, but they all suffer from complaints about them being built for kids/teens, or uncomfortable, etc. Then my wife mentioned a camping chair that a friend had purchased. The Monarch Chair by Alite. While a bit spendy, I did have an REI gift card, and the gaming chairs I was looking at were all at least $70. A quick drop by REI, and I came home with the chair. 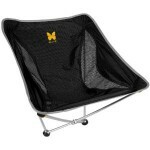 Basically, it’s like an L shaped hammock that uses sturdy tent pole type framing to hold it together. It’s really meant for camping/backpacking, but the comfort wonderful. And if you put it right infront of our guest bed, you can basically lean back into it. You also get the same basic rocking action that gaming chairs have.